Ask a child under the age of about fifteen about “Skullduggary Pleasant” and just wait for the grin… followed by a breathless inundation of praise for a series of books that has just hit number seven! How could I have not heard of this before? “As a black belt in Kenpo Karate he has taught countless children how to defend themselves, in the hopes of building his own private munchkin army. He firmly believes that they await his call to strike against his enemies (he doesn’t actually have any enemies, but he’s assuming they’ll show up sooner or later). Needless to say, the rest of the book is equally awesome. A young girl discovers a world of magic and danger with the guidance of an irreverant skeleton detective (who I am sure is a fictional incarnation of Derek Landy himself). If (or perhaps when) I am a ‘famous author’, I want to be just like him! 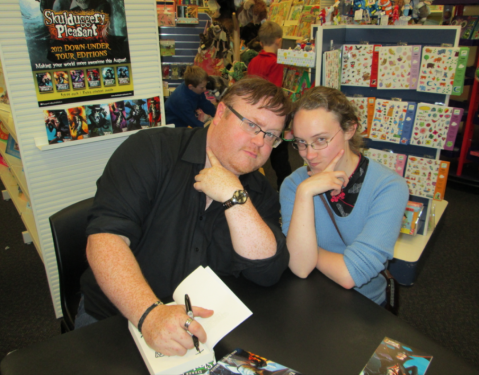 I thought that Derek Landy was just as I had imagined him. He was so very funny. I was at the very back of the ridiculously long line, and so am very lucky to have gotten some signed books. It was good seeing you there, Beaulah!